January 10, 2005 – The modest ginger root, curcumin, is demonstrating in the lab exactly why traditional healers have used it for thousands of years. Curcumin, an ancient spice in the ginger family, also known as turmeric root, is gaining plenty of attention for its positive impact on a number of ailments. It is shining as an antioxidant, for example, as well as for its beneficial effects in prohibiting tumors, for its anti-inflammatory properties, and even for its ability to retard some of the progress of the virus that causes AIDS. This sounds like a lot of claims for a seemingly unpretentious kitchen spice. But, in fact, curcumin’s use dates back to the time of Egyptian pharaohs and Indian rajas more than 6,000 years ago. A tall, stemless, perennial plant cultivated throughout the tropics, especially in India, China and Indonesia, turmeric is what gives curry its unique flavor and color. 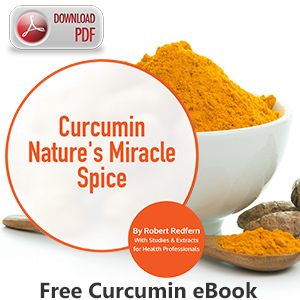 But in addition to its kitchen uses, curcumin has been used by traditional medicine for liver disease (particularly jaundice), indigestion, urinary tract diseases, blood purification, inflamed joints (rheumatoid arthritis), insect bites, dermatological disorders and as an atherosclerosis preventative. Although the chemical structure of curcumin was determined in 1910, it was only during the mid 1970s and 1980s that the potential uses of curcuminoids in medicine began to be extensively studied. For example, curcumin has demonstrated, in vivo, the ability to decrease total cholesterol and LDL cholesterol levels in serum, and to increase the beneficial HDL cholesterol. It inhibits platelet aggregation induced by arachidonic acid, adrenaline and collagen. Where lipid peroxidation was induced by carbon tetrachloride, curcumin significantly decreased the level of lipid peroxidation. In one study, bile acid output was increased by nearly 100 percent. In another study of mice and hamsters that were fed a special diet to induce cholesterol gallstones, the incidence of cholesterol gallstones was reduced by curcumin. Other studies have demonstrated curcumin’s positive impact against ulcers, hardening of the arteries, and in warding off harmful stomach bacteria. Let’s examine the science behind the claims. Free Radicals do their damage with a sequence of changes resulting from an injury (burn, thermal shock, etc. ), and ultimately oxidative stress from the depletion of antioxidant defense mechanisms. Curcuminoids, and other antioxidants, have the ability to merge with potential radical molecules, preventing free-radical formation. An interesting benefit of turmeric and curcumin appears to be its significant antioxidant activity. To fully understand the antioxidant properties of curcuminoids, let’s begin with the role of oxygen in our body. The trade-offs for oxygen utilization (metabolism) in the body are oxygen by-products. They become waste that pollutes the body and causes damage to our DNA (genetic material which is the blueprint for the cells’ command center), proteins, lipids and other molecules in the cell. Even the defense of the body against foreign invasion, like microbial infection, involves a trade-off. These defense mechanisms naturally produce oxidants which can kill the invading bacteria, but may also cause injury to the body cells. Other oxidants produced by the body are cytochrome enzymes, which are abundant in the lungs and liver. These organs protect the body against toxins entering from air, water and food. Outside influences, such as an excess of metals like iron and copper (and their salts), and oxidized fats, may generate oxidants in the body. As a defense reaction, normal body functions generate oxidants such as superoxide, hydrogen peroxide, hydroxyl radicals and lipid peroxides. Such oxidants are referred to as free radicals-“radical” (as opposed to the stable molecules), and “free” (to start a chain reaction in the body that will destabilize surrounding cells). This process leads to tissue and organ degeneration that will eventually result in chronic inflammation, heart disease, accelerated aging and disorganized cell growth that may result in cancer. Antioxidants can stop free radical damage by either minimizing or preventing the oxidants’ initial formation, or by neutralizing the existing free radicals in the body. The aging process exemplifies the cumulative result of free-radical damage to cells, tissues and organs. The body has built-in mechanisms for counteracting free radicals but, unfortunately, the aging process and disease gradually overwhelm the antioxidant defense reaction. Fortunately, some vitamins, minerals, herbs and their compounds such as phonemics, flavanoids and carotenoids, have the ability to scavenge or neutralize free radicals. Curcuminoids, for example, merge with these potential radical molecules and thus prevent free-radical formation. Inflammation is known to be associated with increased levels of lipid peroxides and free radicals, which are generated by the liver as well as by inflamed tissues in the body. Animals fed curcumin showed decreased levels of lipid peroxides and subsequent reduction in the processes of inflammation. One study showed curcumin to be eight times more powerful that vitamin E in preventing lipid peroxidation. Taken in group arrangements such as C-complex, curcuminoids are three times as potent in neutralizing free-radical molecules. In summary, the antioxidant mechanisms of curcuminoids may include one or more of the following interactions: They may intervene in oxidative attacks to restrict or prevent them from happening; scavenge or neutralize free radicals; and break the oxidative chain reaction caused by free radicals. Curcuminoids inhibit enzymes which participate in the synthesis of inflammatory substances in the body. The natural anti-inflammatory activity of curcuminoids is comparable in strength to steroidal drugs, and such nonsteroidal drugs as indomethacin and phenylbutazone, which have dangerous side effects. Inflammation results from a complex series of actions and/or reactions triggered by the body’s immunological response to tissue damage. This damage may be caused by physical traumas including various diseases and surgery. Moderate inflammation is necessary for the healing process; however, continuous inflammation leads to chronic conditions like arthritis and its associated pain. In a double-blind, controlled study, three groups of patients received either curcumin (400 mg), the anti-inflammatory prescription drug phenylbutazone (100 mg), or a placebo (250 mg of lactose powder) three times daily for five consecutive days after surgery. They had been admitted for either a hernia condition or an accumulation of fluid in the scrotum. The results: curcumin was just as effective as phenylbutazone in reducing post-operative inflammation. Curcuminoids prevent the synthesis of several inflammatory prostaglandins and leukotrienes. When the anti-inflammatory properties of curcumin were tested in a double-blind clinical trial in patients with rheumatoid arthritis, curcumin produced significant improvement in all patients, and again the therapeutic effects were comparable to those obtained with phenylbutazone. Further, oral administration of curcumin to rats, at a dose of 3 mg per kilogram of body weight, and sodium curcumin at a dose of 0.1 mg/kg, inhibited formalin-induced arthritis in the animals. In fact, curcumin once again was comparatively as effective as phenylbutazone in this application. In a double-blind trial in 49 patients diagnosed with rheumatoid arthritis, when curcumin was given at a dose of 1,200 mg per day for five to six weeks, there was an overall improvement in morning stiffness and physical endurance; this yielded comparable effects to those obtained with phenylbutazone. Other inflammation-related illnesses? Patients with chronic respiratory disorders experience significant relief in symptoms such as cough and shortness of breath. Eye drops of a turmeric mixture were administered in 25 cases of bacterial conjunctivitis, an inflammatory condition of the eye. Symptoms such as eye redness or a burning sensation began subsiding after the third day of treatment. During the six-day treatment period, it was determined that 23 of the 25 patients were relieved of all symptoms. Curcumin has a similar action to aspirin. However, unlike aspirin curcumin inhibits synthesis of inflammatory prostaglandins, but does not affect the synthesis of prostacyclin, an important factor in preventing vascular thrombosis. Any drug that affects its synthesis (especially when used in large doses) may increase the risk of this dangerous condition. Curcumin may therefore be preferable for patients who are prone to vascular thrombosis and require anti-inflammatory and/or anti-arthritic therapy. In a recent study, cats exposed to myocardial ischemia-reduced blood flow in the heart tissues, a condition resulting from the consequences of a heart attack, were evaluated using curcumin and quinidine, a standard antiarrhythmic drug. Both of the substances protected the animals against a decrease in heart rate and blood pressure following restricted blood flow to the heart. 2. Through ongoing efforts to develop a vaccine against the HIV infection, which so far has been unsuccessful. CD-4 and CD-8 cells are acronyms for the immune cells called T-lymphocytes, which are responsible for some of the most sophisticated activity of the immune system. The T-lymphocytes function to regulate the entire immune response. With regard to this regulatory function, the T-lymphocytes can be divided into T-helpers and T-suppressors. The T-helpers stimulate the immune response to provide protection against invading microorganisms. The function of T-suppressors is to stop this action when appropriate-for example, at the point at which infection has been overcome-in order to avoid excessive immune system activity being turned against the body itself. Balanced interaction between T-helper and T-suppressor cells represents self-regulation of the immune response. Self-regulation is regarded as the most crucial aspect of this response. In HIV infection and AIDS, T-helpers cells become a primary target of the infection, becoming increasingly incapacitated and destroyed by the virus. The current definition of AIDS includes HIV infection with T-helper (CD-4) cell counts lower than 200 per ml of blood. This immune system is usually unable to defend the body against various viral, bacterial and parasitic infections. The microorganisms take advantage of the weakened defense system and invade the body; hence those infections are referred to as opportunistic infections. HIV cannot live without being fully integrated in the live body cell. The enzyme integrase facilitates integration of the virus genetic material with the genetic material in the cell. The genetic material of the cell begins to serve the virus, not the cell. Now, here is the potential payoff: curcumin was found to inhibit the activity of integrase, potentially preventing HIV from finding a home in CD-4 and CD-8 cells. In a study, the administration of 2,000 mg of curcumin given to 18 HIV-infected patients for approximately 20 weeks resulted in a significant increase in the CD-4 and CD-8 cell counts, as compared with the placebo-receiving patients. The CD-4 cell count before the treatment ranged from 5 to 615 cells per ml of blood, and the respective range after treatment was 283 to 1,467 cells/ml of blood. Diets supplemented with curcuminoids protect the integrity of biomolecules in the body. Preventing the deterioration of food, and keeping nutrients in tissues from degenerating, appear to be closely related. For example, the properties in turmeric which prevent meat from becoming rancid help to provide edible animal protein that contains less oxidized fat or free radicals. When this type of food is ingested, it supplies clean nutrients rather than free radical-damaged nutrients. The same attributes of turmeric that preserve the freshness of food may also protect living tissue from degenerative disease. Feeding curcuminoids to laboratory animals resulted in elevated levels of the enzyme glutathione S-transferase, an important index of the efficiency of detoxification.